Turn your DAW’s mixer into a sonically authentic 64-channel SSL with this groundbreaking, workflow-boosting plugin. ‘Buckets’ system is great, genuinely emulating a full SSL console. Excellent SSL-style EQ, dynamics and analogue distortion. Insert point for a Waves plugin. Can’t move between Channel Views. The latest collaboration between Waves and Grammy-winning engineer Chris Lord-Alge is an emulation of a full channel strip from the latter’s actual SSL 4000 series mixer, with a particular feature that can only be described as ‘killer’. Claiming to be “the first multitrack” plugin (Softube’s Console 1 system is similar in concept but very different in execution), CLA MixHub lets you access up to 64 instances of the plugin via any one of them. Thus, a full SSL console is effectively recreated in a single window within the host DAW, conveniently grouped into banks of eight channels at a time, called ‘buckets’. Once inserted into as many channels of the host DAW’s mixer as you need (see Kicking the Buckets), any running instance of MixHub can be switched between its Channel View (ie, all of its own channel strip components together) and the grouped Bucket View, where the selected bucket of up to eight channels is flipped between grouped operation of one of said components at a time. While that’s certainly the headline, however, it wouldn’t count for much if the channel strip itself wasn’t up to snuff - which, fortunately, it very much is. The four main component modules largely mirror their SSL inspiration, comprising Input, Output, EQ and Dynamics. There’s also an Insert slot into which you can plumb any one of your installed Waves plugins. Input, EQ and Dynamics can each be set to stereo, dual mono or mid-side configuration, and clicking the Expanded View button on a module blows it up to two separate channels (left/right or mid-side) for independent tweaking, and reveals the Dynamics module’s Sidechain EQ, or opens the interface of the Insert plugin. The EQ, Dynamics and Insert modules can be freely rearranged by dragging them left and right. The Input section has Line and Mic input level controls, each dialling in its own style of harmonic distortion when pushed hard, and Mic adding up to 50dB of gain. This distortion (and more at the output) can be disabled by deactivating the Analog button, while the Noise function models the background noise of Lord-Alge’s SSL. All of this analogue flavouring is very subtle. Phase invert, low- and high-pass filters, and a -20dB pad round off the Input module. The EQ is an exact match for the SSL original, with two fully parametric mid bands flanked by high and low bands that can be switched between shelving and bell modes. Up to 15dB of cut or boost is on tap for every band, and the LMF and HMF Q controls range from sharp and surgical to broad and musical. MixHub’s multitrack workflow couldn’t be easier to operate. You start by loading the plugin onto every channel of your mix - don’t worry, it’s impressively light on CPU usage. You then assign each instance to one of eight ‘Buckets’ - each of which holds up to eight channels - either via a menu or a colour-coded assignment overview. So, you have one Bucket for your drum channels, another for your vocals, one for your guitars, etc. Then, flip any instance of MixHub from the regular Channel View to Bucket View to see your choice of the four channel strip modules (Input, EQ, Dynamics or Output) for the up-to-eight component channels of the active Bucket, ready for visually grouped editing, with eight tabs along the top used to switch between Buckets. Most of the Channel View controls are visible for each module, and those that aren’t (the Output format buttons, for example) can be revealed via the Expanded VIew button, which shows the full module for one channel - but not, alas, its full strip. The name of each plugin’s host track appears at the top of its strip in Bucket View (although we did experience the odd bug in that department, necessitating manual renaming), and channels are rearranged within Buckets by dragging and dropping. 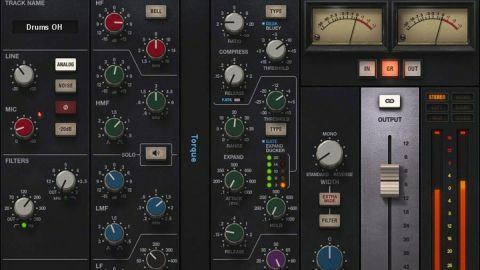 The Dynamics section is headed up by a compressor that switches between the original SSL design and sound, and an emulation of Lord- Alge’s ‘blue stripe’ (or “Bluey”, as he calls it) Universal Audio 1176, with its lightning fast attack and alternative sound. Both models offer ratios up to inf:1, and two Attack speeds. Below that, the Gate/Expander adds ducking to the SSL setup, complete with Hold control, and a full-on sidechain EQ for highly detailed shaping of external keying signals. There’s also a Dry/Wet mix control for parallel processing. Finally, the Output module houses a bank of buttons for selecting mono or various stereo output formats, stereo widening and narrowing, a 200Hz LF shelf, and comprehensive metering. The first thing to say about CLA MixHub in appraisal is that it sounds superb. Waves are no strangers to big desk emulation, and this one’s a beauty, exuding analogue warmth, depth and focus. Just like a real SSL, the EQ is easy to work with, while the extended Dynamics section gives plenty of enveloping options. The multitrack functionality is nothing short of revelatory, feeling like a natural replacement for the standard DAW mixer. Jumping between Buckets and modules is fast and intuitive, and there’s a real sense of empowerment that comes from being able to apply such high-end processing to the individual elements of a whole drum kit, vocal group, etc. And although changing one instance of the plugin from Bucket to Channel View or vice versa also changes all other instances, you can have as many different Bucket Views open at a time as you like. With a big enough monitor, you could conceivably get eyes-on with the whole console! We do have a few niggles, though. Presumably due to the limitations of VST/AU/ AAX plugin implementation at this point, there are no mute or solo buttons, and having to head back out to the host mixer to hear channels in isolation does break the spell somewhat. Also not Waves’ fault, you can’t step between instances in one plugin’s Channel View. This isn’t a major problem, thanks to the Bucket View’s Extended View function, but when you want to see the full channel strip for a track, you do have to navigate to its plugin. And a wish rather than a complaint: it would be great if each Bucket served as a proper hierarchical bus, with its own top-level EQ and dynamics modules for processing its assigned channels collectively, rather than just being a visual grouping. Unavoidable technological limitations aside, however, CLA MixHub’s channel-aggregating approach works very well indeed, bringing your entire mix together in a single interface, and sounding fantastic doing it.